― Mehmet Murat ildan (misquote). Well first of all let’s answer the question, what is marketing automation? Marketing automation is the use of various digital tools to remain engaged with your customers in a time-efficient way. It can also help you reduce the laborious repetitive tasks many small businesses face. 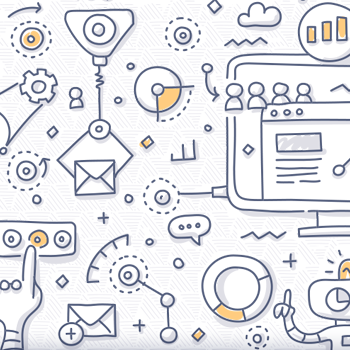 How can marketing automation help with customer engagement? Marketing automation can be set up to respond to a website enquiry, remind customers that they have left items in their shopping cart, congratulate customers on special occasions such as a birthday or wedding anniversary and more. You have no doubt experienced this when online already. How can this work practically? Well, let’s say you offer wealth management services. An automated process can be set up to support existing digital marketing activities. Broadcast an email to a targeted data set, ideally personalising the greeting, “Hello Pete”, etc. That email will contain links to your website. e.g. services in this example; Mortgages, Pensions and Retirement Planning. If a recipient opens the email, clicks on Mortgages and views the advice presented, an automated email specifically relating to Mortgages can be sent an hour/day/week later providing further advice or even encouraging an appointment set up. If the appointment is booked via an online facility, another automated email can be sent as a thank you for setting the appointment in place. A few days prior to the appointment, a reminder email would be issued with useful information presented; a reminder of date and time, the person they will be meeting, items to bring to the meeting, etc. Following the meeting, a thank you email with a polite message could then be issued. In this example, five relevant and useful engagements take place automatically, providing your customer with a better level of service. Imagine the time saved in phone calls and general correspondence. If you have concerns about automated marketing being impersonal, read this case study. It’s based on a family run traditional coffee house. Swimming Hippo currently runs automated email campaigns and the activity gained from them is impressive, including average open rates of 50%!